The characteristics of silk pajamas is strong sense of comfort, which is wet rendering , sound-absorbing and sound vacuuming. Silk is made of protein fiber, which is soft and smooth in texture as well as delicate in touch feeling. Compared with other fiber fabrics, the skin friction coefficient of silk is only 7.4%, so when people's skin is in contact with silk products, they can produce a soft and delicate feeling. Silk pajamas have a natural moisture absorption and rendering nature, which can not be compared by the other man-made fibers. Due to its porous nature, the silk can absorb the air gap, which can absorb moisture in the air or distribute water, so that it can absorb moisture in a humid environmentand can free moisture in a dry environment. Therefore, in addition to the self adaptation ability, it can also help the skin or other silk products to retain a certain amount of moisture; if wearing in summer, the silk clothes can make sweat and heat quickly dissipated, whose permeability is strong, thus making people feel very cool. Silk boasts the unique health care function and the silk fiber contains 18 kinds of amino acids necessary for the human body, which is almost the same with the amino acids contained in human skin, so it’s called"the second skin". At the same time, the silk protein tryptophan and tyrosine can absorb ultraviolet light to prevent ultraviolet radiation, to enhance the vitality of skin cells andto promote skin cell metabolism, which have a good role of adjuvant therapy for some skin diseases. The natural function of this artificial silk has laid the precious value for silk products.In addition, because of the small silk fiber thermal denaturation and heat resistant traits, the burning temperature is in 300~400 degrees, which is difficult to burn. Threrefore, it has a very high flame retardant effect.Thusit’s wise to select mulberry silk as raw material for home decoration. 2. How to choose the right silk pajamas? In Summer,people shall choose silk pajamas. Because it’s so hot in summer thatpeople often sweat.And cotton pajamas are not that breathable and moisture-absorbing as silk pajamas. The biggest feature is that, when your skin is dry, it can absorb moisture in the air; when you sweat, it can help you give out the moisture.Its permeability is very strong, thus making people feel cool. In Spring and summer,the silk pajamas thickness should be below 19 momme, pajamas over 19 momme is more suitable for winter use. 19 momme pajamas is the best choice for the summer, which also represents the top quality. 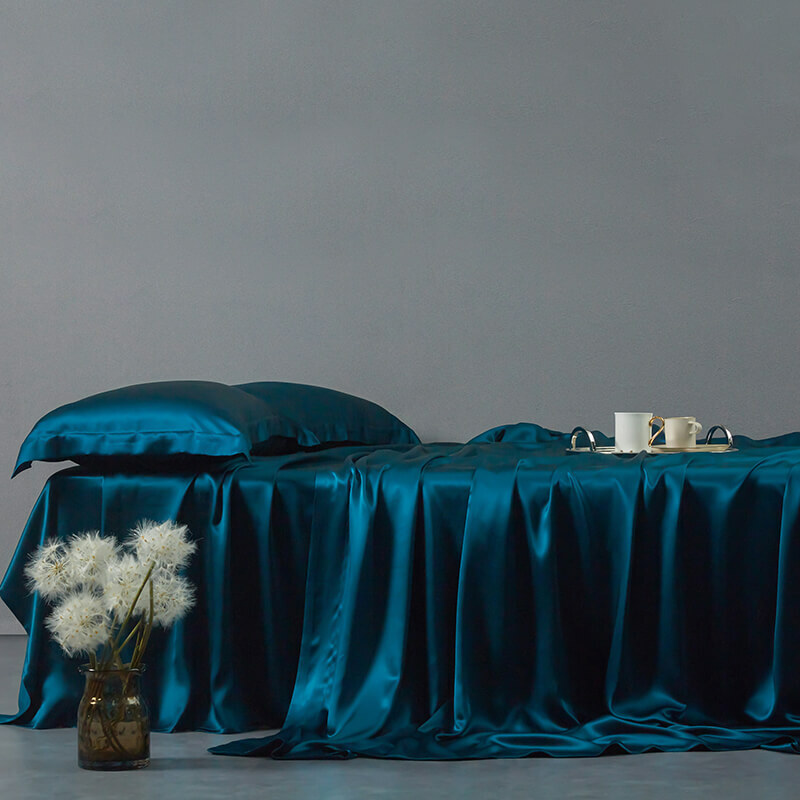 19 momme boasts the best vertical sense and elegant feeling, which can greatly show the unique charm of silk. It’s not easy to line at 19 momme. While in autumn and winter, 30 momme pajamas shall be selected, which is beautiful and warm. How to buy silk pajamas? The above mentioned summer 19 momme silk pajamas is a very good choice.Whilethey may be expensive, there are also some sound priced products on the market, such as Shanghai story. Embroidery began in Chinaand China's embroidery was far ahead of the world. The embroidery is classified as handmade embroidery and machine embroidery, handmade embroidery is generallycustom-made style because of high prices, and most embroidered pajamas on the market adopts machine embroidery. Chinese embroidery is currently most well-known by Taiwan embroidery, which is also higher than other cities in terms of grade. It’s its exquisite workmanship, complex processes, exquisite appearance and strict checks that make it the most famous. During the daytime, our most intimate underwear is bra and other underwear, but the most intimate underwear is pajamas at night. There are many kinds of fabrics and styles for pajamas, which wears comfortable and smooth, let’s learns about the classification and benefitsof silk pajamas!In terms of style, silk pajamas can be divided into four types: two-piece, sling type, split type, one-piece pajamas (robe). Two-piece silk pajamascan be worn inside and outside of the sling and in collocation gown, which is elegant. The underwear made of pure silk can not only display good effect, but also has a unique role in the prevention and treatment of skin and health. Sling type is commonly used in summer. Since the summer weather is dry and sweating hot, considering the appearance, the sling style nightgown emerges. The biggest advantage of split pajamas is easy to wear with ease. Its style is mainly reflected in the changes in the coat collar type.Small collar style jacket is the most common type of collar with loose design, which fully reflects the practical value. In pajamas family, this this one-piece robe appears earlier. It not only divides the clothing from work and home, but also implies people's life tasteand the pursuit. The robe style changes little.A belt will make the skin embraced with the robe. Use neutral detergent to wash, putting the clothes into the cold water for 10-15 minutes, then gently ruband then wash with clean water. The hand washing is recommended, avoid hard twist and don’t use the washing machine to wash.
Don’t twist, please gently shake off in natural hanging state. Don’t expose in the sun, don’t use the dryer to dry. Generally,puttingat a cool and ventilated place for drying. Dry by 70% level, then evenly sprayed water, ironing temperature should be controlled at 150 degrees Celsius steam ironing. It should be washed, driedpreferably covered with a cloth.The camphor or health ball etc. should not be put in the wardrobe.